Hoof abscesses seem to come on suddenly, although that’s not really the case. You are out riding and without warning your horse is lame. While there could be a number of reasons, a hoof abscess is a strong possibility. An abscess is described as a tender area surrounded by pink to red tissue. The center is filled with pus and debris. It feels warm when touched and is usually very painful. Abscesses can occur anywhere in the body, but when the hoof is involved, it’s too painful for the horse to place weight on the area. With proper care, abscesses can easily be card for and leave no lasting damage. Hoof abscesses are infections that enter the area between the sole and the wall of the hoof. A weakened sole/wall junction can allow bacteria to enter. The white blood cells that the body sends to fight the infection and inflammation expand the area. This causes pressure to build up as there’s no place to go because of the rigid hoof wall and an abscess forms. There are a number of ways a horse may develop a hoof abscess. Stepping on a stone or other sharp object can cause injury. In dry weather the hoof may shrink slightly and tiny cracks may appear. When the weather becomes wet, bacteria can get into the hoof through these cracks. 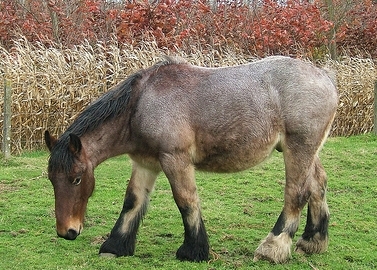 Bruising to the hoof may occur due to poor ground conditions. A hot shoe placed on a thin sole or a sole that is only partly healed from an existing injury can cause what is known as a sterile abscess – one that is not the result of an infection. Stalls that are left dirty can be the culprit. Any defects in hoof conformation leads to stress in the area and possible injury. Sometimes abscesses break open by themselves and drain. In any case it’s a good idea to have your vet examine the horse to determine the problem. Treatment involves cleaning the wound, draining the abscess, sometimes using foot soaks, applying poultices, keeping the foot wrapped to protect it from further infection. If necessary, your vet will prescribe anti-inflammatories and antibiotics. If treatment does not resolve the problem, further tests will be necessary. In cases of severe abscess, the horse may have to wear a pad or plate for a time to protect the foot. Prognosis depends on the severity of the abscess. Good care for your horse’s hooves can help avoid problems. Check your horse’s hooves regularly and clean out any dirt and debris carefully so as not to damage the area. Wearing shoes can help. Make sure your farrier trims your horse’s hooves properly.